Our Circle of Moms > blog > Advice > Put A Lid on Your Kid! Winter is just about here, and in New England, winter includes snow and some excellent skiing locations. My wife and I are avid skiers and the past several years we have introduced the sport to our two young sons, Aiden (4) and Tyler (6). When we take our sons skiing we always make sure they are wearing a helmet. I see way too many young children skiing or snowboarding without one and it shocks me. 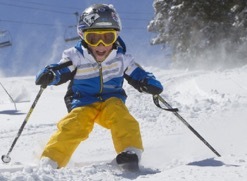 According to the National Institutes of Health (NIH), an estimated number of 78,538 snow sports-related head injuries among children and adolescents were treated in emergency rooms during the 14-year study period (1996 to 2010). Among these, 77.2% were traumatic brain injuries (TBI’s). Knowing this alarming statistic, I don’t know why any parent allows their child to ski or snowboard without a helmet. What’s also alarming about this statistic is that during that NIH study (from 1996 to 2010), the incidence of TBI increased over the 14-year period among adolescents. Given the increasing incidence of TBI among adolescents and the increased recognition of the importance of concussions, greater awareness efforts are needed to ensure safety, especially helmet use, as youth engage in snow sports. Now, I understand that wearing a helmet while skiing or snowboarding does not prevent a fatal injury, but what it is going to do is lower the risk of sustaining a serious injury. Some experts have said that helmets perhaps encouraged risky behavior, creating more problems than they solved. It’s definitely a valid point. I can’t count the number of times I see these fearless little “bombers” shooting down trails at Mach 3. But the evidence is clear—those who do not wear a helmet while skiing or snowboarding, sustain a significantly greater burden of injury and more severe head injuries. So why take the risk? My wife and I say, better safe than sorry. So put a lid on your kid!